Great resumes are like effective TV advertisements. They’re short, engaging, and tailored to sell. Of course, the product they promote is you, and their target demographic comprises search engines and HR professionals. Every element of a great resume courts this audience. With a quick glance or scan, resumes will be judged even before they’re read. They should thus make good use of headings and whitespace to look visually appealing and nicely structured. This unspoken “body language” of the document invites viewers to engage. Conversely, a solid monolith of letters and words puts people on guard, making them hesitant to continue. A great resume should look equally professional and approachable. Towards that end use only one typestyle, limited bold and italic type, clean borders (not a lot of levels of indentation) with blocks of information that are easily identified, large enough type to be easily read. Keep it brief. Three pages is generally the outside limits. People looking through resumes often have very little time to decide whether a particular resume likely represents the kind of candidate they need. An effective resume thus promotes its owner for a specific job within the first two-thirds of the first page. It does so by beginning with a short summary of who a person is, how they’ll benefit a company, and why they’ll excel at a specific role. 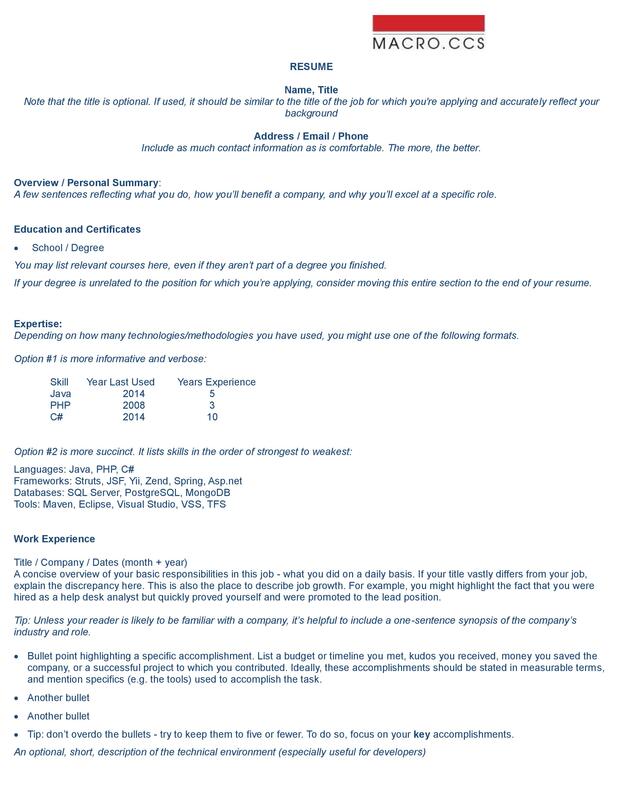 This Personal Summary replaces the Personal Goal which introduces some resumes, and describes how you’ll help a company rather than simply what you want. Effective resumes highlight relevant skills and knowledge immediately after the Personal Summary. They then proceed to introduce the jobs and training though which this ability was obtained. Resume writers often try to demonstrate advancement, yet leave the casual reader with the impression that the writer frequently moved from one job to another. If you’ve had several positions at the same company, or worked with companies that merged, it can appear that you hopped around cavalierly. To avoid this, list employment dates as a single time period. Nested beneath this time frame, list each individual position as a separate line item or paragraph – each with specific dates following the title of the position held. Conventional resumes avoid the use of first-person words like “I” and “me.” You’re implicitly the resume’s subject, so such words are redundant. Stripping your resume of unnecessary words keeps it concise, which makes you seem efficient. Liberally using verbs to describe your accomplishments will similarly help make you seem accomplished. The following six rules for effective writing are from George Orwell’s 1945 essay, Politics and the English Language. His advice applies beautifully to resumes. Even professional writers rely on editors – you should too! Ask at least two people to proof-read your resume. In addition to the spelling and grammar, ask them to verify that all dates make sense. Tailor your resume for the job you wish it to get you. This may entail rewriting your personal statement, or reorganizing your accomplishments to highlight those more closely align with the job to which you are applying. It is fine to have vastly different resumes for different audiences as long as they’re each honest. Think carefully about how and when to use technical acronyms. One the one hand, they’re often well-known and expected. On the other hand, they may obscure your resume from HR personnel and search engines. Consider using acronyms only in the Keywords section. Do your research: a simple Google search of your professional title and the word “resume” (for instance, “software developer resume”) will provide many examples of formats and styles. 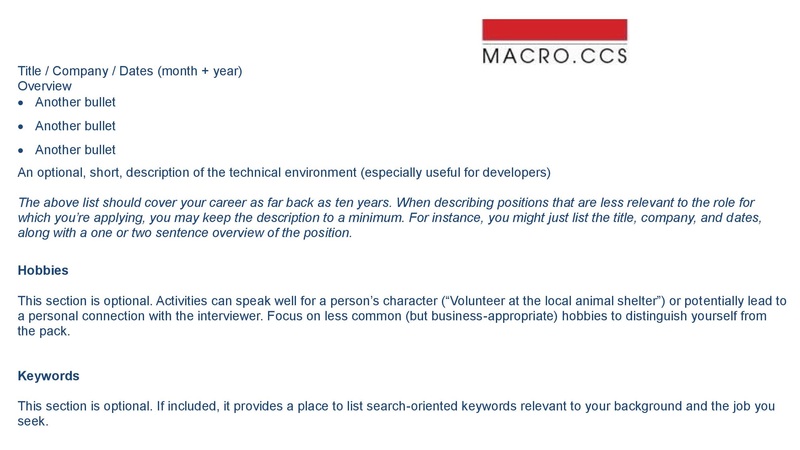 While reviewing the tips from this document in mind, and determine which style is best for you and your job history. Of course, be honest and accurate. “The Compelling Resume” was authored by Ben Leibert, Software Development Recruiter, & Marjie Peterson, founder and President of MACRO.CCS. © 2014; all rights reserved.